The Margaret Thatcher Foundation has released its latest batch of the late prime minister's papers. 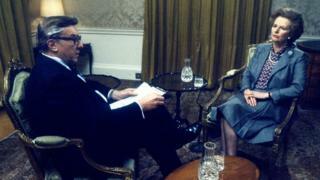 They show a decidedly more personal side of The Iron Lady. The memoirs of Mrs Thatcher's private secretary for foreign affairs, John Coles, contain some of the juiciest revelations in the latest release. He recalls his surprise when she told him "just two or three days after the Conservative victory of 1983, 'I have not long to go'. For someone who had just won a majority of 140 seats, this was a remarkable statement". "When I queried it, she said: 'My party won't want me to lead them into the next election - and I don't blame them.'" Four years later she led the Conservative Party to a 102-seat majority in the House of Commons. Margaret Thatcher received many plaudits for her unflappability in the aftermath of the Brighton hotel bombing on 12 October 1984. John Coles wrote to her: "We shall remember not the bomb or the ruined building, but your courage, calm and nobility in the aftermath." The latest papers illustrate her attentiveness to rather more mundane matters of etiquette, even under the shadow of terror. She wrote to her hairdresser to cancel an appointment the next day, taking care to thank William and Carol Thorne of East Sussex for their sterling earlier efforts: "I was very pleased with the way you did my hair, and the fact that it lasted so well through Friday was the real test." Mrs Thatcher's dressmaker, Daphne Scrimgeour, was another person to lose her appointment with the PM in the aftermath of the bomb - and unidentified guests who had surely looked forward to "lunch at Chequers" were scratched out of her diary. Before the Brighton bomb Margaret Thatcher had planned her conference speech to be a fiercely critical assessment of Labour. She was set to accuse the party of being "riven by factions" and "infiltrated with extremists". But the IRA changed her plans. Chris Collins, of the Margaret Thatcher Foundation, says the address had been intended to "eclipse" her "Enemy Within" speech, but the death and destruction in Brighton led to a "softening to fit the national mood - and a softening to fit her own stance". "In the days that followed the bombings she received hundreds of letters of support - including from opposition politicians - which genuinely moved her. It is ironic that the speech is softened by a great act of violence." The initial draft was torn up, only to be reconstructed with sticky tape by the PM, who presumably judged it too good to destroy forever. The first female prime minister had to wade through a diplomatic quagmire that, it seems safe to say, no male occupant of the office will ever stumble into. After agreeing to a request by the German Central Horticultural Association that it be allowed to name a rose in her honour, Mrs Thatcher was embarrassed to discover a letter in her in-tray from an irate Japanese businessman. One Mr Takatori had received permission to name a rose in honour of the prime minister six years previously. Peter Ricketts, now a knight of the realm and Ambassador to France, was instrumental in crafting a sensitive solution. A letter was dispatched to Mr Takatori that read: "The two roses are different in appearance, but if an error has been made, the prime minister very much hopes that it can be satisfactorily and easily resolved. We can understand your concern, and would like to assure Mr Takatori of our high regard for the masterpiece he named." Whether this appeased Mr Takatori is unknown. Mrs Thatcher survived one of the less damaging scandals in recent political history. Previous revelations from the Margaret Thatcher Foundation's files included the fact that many Conservative MPs were privately sceptical of military action to retake the Falklands after the Argentine invasion in 1982. It also became clear that the government had a list of 75 mining pits to be closed over a three-year period, rather than the 20 it had initially claimed. And then there was the disclosure that MI5 had learned the Soviet Union tried and failed to funnel £1.2m to the National Union of Mineworkers via a Swiss bank account - prompting Mrs Thatcher to raise the matter with Mikhail Gorbachev at their next bilateral meeting.